What an honor this was: Steve Wozniak was at the HP Tech Forum to sign books and talk about his role as lead scientist at Fusion IO. So when he agreed to come in to the booth and talk with myself and Andy McCaskey, we were floored. Therefore, we have a 2 part interview. The first part, Jeffrey Powers interviews Steve on the role of “Chief Scientist” at Fusion IO. Steve talks about how he is working for a company that is working on technologies that will take us to the next level. If you remember last year’s HP Technology Forum, we interviewed Fusion IO and the giant video screen – 1,000 videos running at the same time. They had the screen once again at Woz’s beach party – this time it runs 1,500 videos at a larger format. 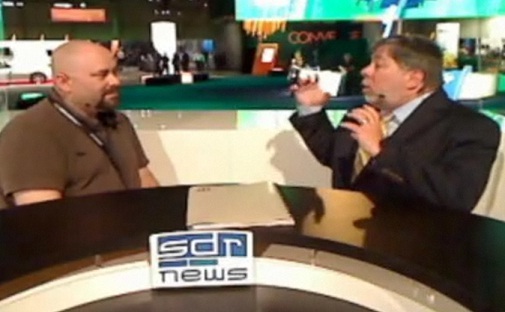 So enjoy part I of the Steve Wozniak Interview. Sponsor: Hold your meetings online for just $49 a month Try GoToMeeting free.